Clear all 81 jellies, bring dawn all ingredients and reach 50000 points to complete the level. This level has medium difficulty. For this level try to play more where more candies are available to play or try to play more from one side to break blockers to have more candies available to play. 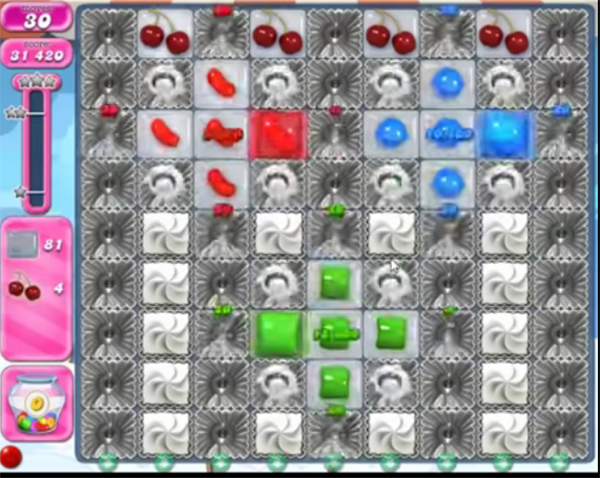 Make special candy as you get the chance and combine them with each other to break jellies and ingredients. I have only 21 moves,but with a GOOD board I think I can accomplish it .Thanks for your co-operation. 1815 completed! 1 hour free play! Double CB combo cleans up. 1815done during free play . Getting really fed up with losing all my boosters! And also the game running in slow motion! No boosters = no help & I am not paying to play!! !